As noted earlier, to date the Project Canada material has been disseminated through seventeen books, numerous monographs, more than one hundred articles, and innumerable academic and public presentations. Some 160,000 book copies have been sold. There's Got to Be More! Nine of the books have focused on religion, five on youth, and three on social trends. A New Day: The Resilience and Restructuring of Religion in Canada succinctly summed up the main thesis in Beyond the Gods & Back, along with reflections on implications and response, in a format that aimed at extensive dissemination. Made available in July of 2012 as a free e-book, over 15,000 copies were downloaded in three months - a figure that now is well over 30,000. Just would appreciate initials, general location, and the book title/titles. Thanks! Canadians are well served by information produced by Statistics Canada and academics that describes the changes in family forms and functions that have taken place in recent years. However, in maximizing personal and social life in Canada, it is important to know not only what individuals are experiencing in the way of family life but also to know what they would like to be experiencing – their aspirations, hopes, and dreams. With such a goal in mind, the Vanier Institute of the Family in Ottawa teamed up with Reginald Bibby to carry out a major national survey in 2003 of close to 2,100 Canadians. The survey produced many surprising and important findings – including the widespread value people are placing on fairly traditional family arrangements, and the reality that many of these same individuals are not experiencing what they want. The survey found Canadians as a whole to be highly respectful of people who cannot and in some instances choose not to live out family life in traditional ways. Overall, this reading of Canadians documents the central importance that most people place on family life. The report, released in late 2004, concluded by discussing ways that family life – however conceptualized and experienced – might be elevated for all Canadians. and Bibby's comparison of Alberta's teenagers with the rest of Canada - Alberta's Emerging Millennials (2010). A Footnote on Christian Smith's "Moralistic Therapeutic Dualism"
"Moralistic Therapeutic Deism" as it relates to Canada. That brief analysis is available HERE. Some of the preliminary results of the 2015 National Religion Survey carried out in partnership with Angus Reid. 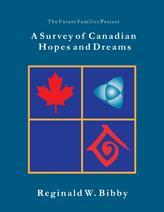 The material provided the key data for the book, Canada's Catholics, co-authored by Bibby and Reid (Toronto: Novalis, 2016). It also is being featured in Bibby's 2017 book with UBC Press, Resilient Gods.